The original natural multi-purpose liquid green soap replaces your bathing, laundry and household cleaning products. Available in 22oz or Gallon size, regular strength, 2X, or 3X. The soap that started it all! One of the most amazing products that has ever been presented to mankind! Revealed to Clayton Tedeton more than 28 years ago. New uses are found all the time! It's a soap, cleaning agent, degreaser, and deodorizer all in one! Miracle II Soap cleans your home, laundry, face & skin, your car, and a whole lot more -- including your windows. Most of this natural product is from the dust of the earth, without the drawbacks and harsh ingredients of regular soaps or detergents. Naturally concentrated, and biodegradable. Dilute it to create solutions for your cleaning needs. Ingredients are: Prayer, Energized Stabilized Oxygenated Water, Ash of Dedecly solution, Calcium, Potassium, Magnesium, Foaming Agent (Coconut extract). Use this on glass, mirrors, countertops, stainless steel, refrigerators, fiberglass, leathers and plastic. Miracle 2 Soap -- 1/8 oz to 32 or spray bottle, but add water very slowly. Dishes, floors, bathrooms, tile, cabinets, paneling, refrigerator, skin, carpet, spot remover, upholstery, stainless steel, fiberglass, auto­mobile, mildew, soot on brick and stone. Miracle 2 Soap -- Add 2 oz to a spray bottle. Floors, grease traps, drains, pots, pans, dishes hands, skins, ovens, glass fireplace doors, white sidewall tires, bad carpet stains, holding tanks on campers, clothes, wax stripper, steam cleaning, oil on carports, crazy glue cleanup. Do not dilute soap. Spray on strong odors such as foot skin, fish, seafood, onion, garlic, dog/cat, refrigerators, bathrooms, hunting clothes, holding tanks on bass boats and campers, odors in carpets -- and leave it on. If you have the bottle of Miracle Neutralizer, put sprayer on bottle. Miracle II Neutralizer has no cover up odor - just a clean no odor area. Heat oven to warm then turn off. Spray well. Let set for 2 to 3 hours or over night if possible. Just wipe away with cloth or sponge. You don't even need gloves!! Carpet: Spray spots; brush, then towel up. If stain has been on carpet for a long time, and it will not clean up this way, spray again and lay a damp cloth on the spot and leave over night. Spray and brush again and towel up. This will take care of 99% of your spots. Spray on and let stand for 2 hours before you put into washing machine. Use from 1/2 tp 1 oz Miracle Soap in machine. If the spot is on something you are wearing. Spray the spot and towel off. It will not burn the skin. Soap will not harm your "no wax" floors and will really shine. Best with Miracle 2 laundry ball plus 1 oz soap. To soften and deodorize; add 1 oz neutralizer from bottle. 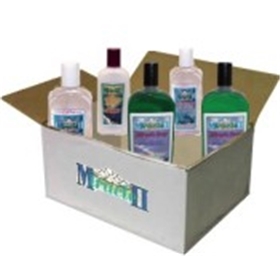 Miracle II Soap - Add 1/4 oz to 32 oz spray bottle of water or 1 oz per gallon. If you see insects, spray extra. When washing vegetables in sink, add 1 or Miracle Neutralizer to water This will cause the parasites to be removed. For bean lovers: When you soak the beans - overnight, add 1 or Neutralizer to the water. When you pre-boil for 15 minutes, add 1 or neutralizer and drain. After that - cook. This will neutralize the gas that is in the beans. Get a trigger sprayer. Put 1 or Miracle Soap and fill with water. Spray insects. Everyone has reported great results. Everyone that uses Miracle II in a total cleanup said they stopped having bug problems in 30 days. Put 1 oz Miracle II Soap Concentrate in one gallon of water or use your bath water Stir ant bed up and pour the solution on them. If you will do this early and late - you will kill more of them. Everyone has reported great results. Shampoo dog and cat with Miracle Soap - rinse. Then spray Neutralizer and let dry. You will never use anything else. It will not hurt their eyes. Heals rashes, and cuts on dogs, cats and horses. Animal lovers, you will love it! Spray with Miracle Neutralizer. This will take the odor away. Use enough Miracle Soap in a pail until suds. It will make the paint shine and you will get a skin treatment. Use about 1 or from bottle in 5-gallon bucket.